The lower house of Belarus’s parliament has passed amendments to the Law on Mass Activities in the Republic of Belarus that specifically ban demonstrations organized through the Internet. «An amendment has been added about the organization of unsanctioned gatherings of citizens with the aid of, among other things, social networks of the Internet,» deputy Anatol Hlaz, deputy chairman of the Committee on Human Rights, National Relations, and the Media, told a Minsk press conference. However, Hlaz told a press conference in Minsk that the reference to «inactivity» had been dropped in the measure adopted by parliament. The text of the new version has not been made public. The draft law was submitted in response to a national wave of protests in which demonstrators expressed their discontent through actions like clapping their hands or setting the alarms on their mobile phones to ring at an agreed-upon time. Belarusian police will no longer need to watch for signs of inactivity. The protests were provoked by the reelection of President Alyaksandr Lukashenka in what was widely believed to be a rigged election in December 2010, a brutal postelection crackdown on the opposition, and a severe economic crisis that is rapidly spiraling out of control. Under the new law, unsanctioned gatherings of citizens organized via the Internet would be banned. Also, organizers are banned from announcing any gathering before it has been sanctioned by the government. Further, people who earlier organized outlawed demonstrations or have been warned about doing so in the previous 12 months by the authorities are banned from organizing new demonstrations. Alyaksandr Dabravolski, of the opposition United Civic Party, told RFE/RL’s Belarus Service that the demonstrations would likely continue in one form or another. «Maybe they’ll take on other forms; maybe they’ll be organized by other people. But the issue is not that someone had the idea to conduct a protest and that’s why it happened. The issue is that people are dissatisfied,» Dabravolski said. The bill must now be approved by the upper chamber of parliament, which is expected to take up the measure on October 21. Belarusian media reported that on October 2 Minsk police warned a group of joggers in a central park that they could be arrested for participating in an unsanctioned event. 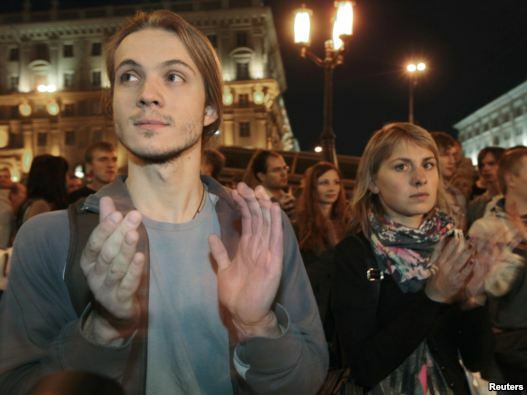 Belarusian Lawmakers Pass New Antiprotest Bill, But Drop Prohibition On ‘Inactivity’.